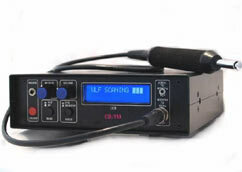 The CPM-700 is a broadband receiver designed to detect and locate all major types of electronic surveillance devices including room, phone, body bugs, video transmitters, and tape recorders. 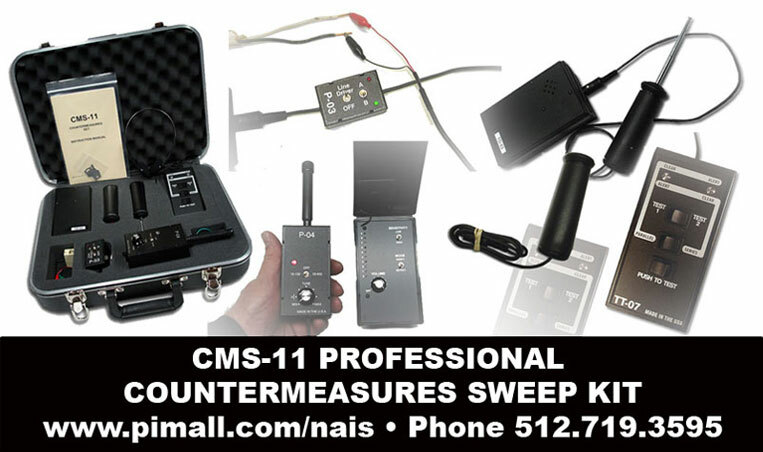 ECONOMIAL PROFESSIONAL COUNTERMEASURES SWEEP KIT! On Sale Now! Special Limited Time Introductory Price! 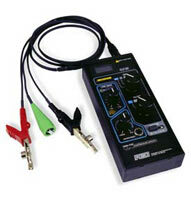 Has Built-In Plug-In Telephone And Telephone Line testing Gear! The all new ACS-007 countermeasures set. Incredible frequency range of 400KHz to 8.5GHz. 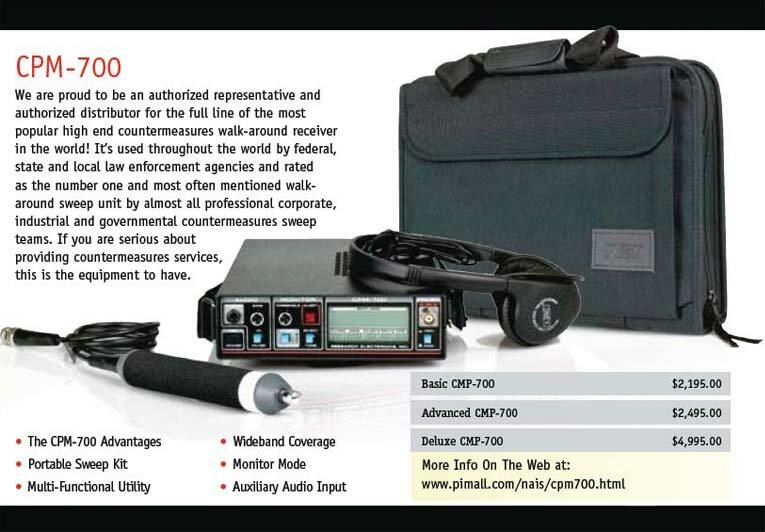 System includes Hard Shell Carry case, RF Probe, IR Probe, all new phone line tone injection/locate unit and much more. Custom manufactured in Israel by a leading Israeli military countermeasures contractor. 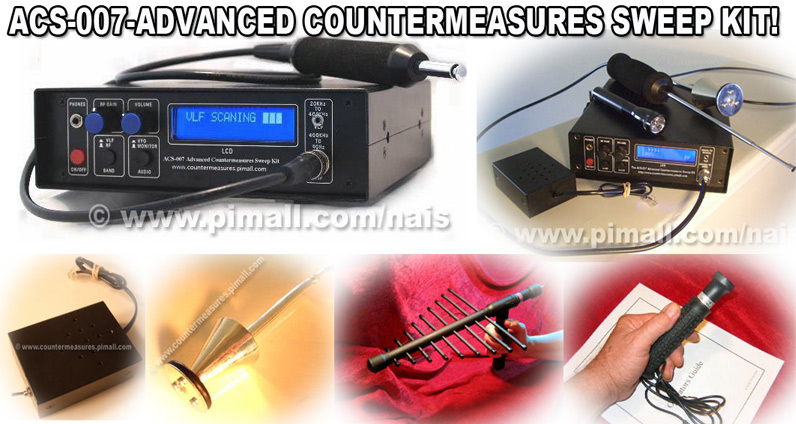 One Portable Countermeasures Unit That Does It All! $1135.00 WORTH OF COUNTERMEASURES GEAR FOR $495.00! 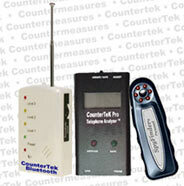 COUNTERTeK ULTRA PRO COMBO PORTABLE COUNTERMEASURES KIT! 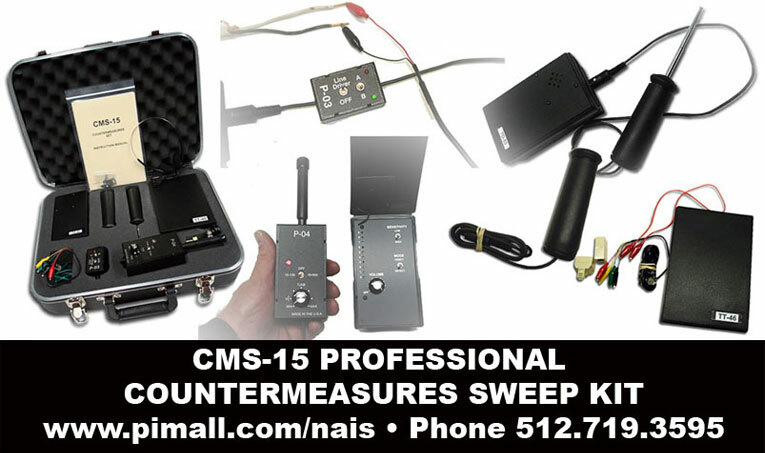 New Portable Countermeasures Sweep Unit That Does It ALL! HUGE VALUE! $835.00 WORTH OF PROFESSIONAL NEW GENERATION COUNTERMEASURES GEAR FOR $ 495.00! 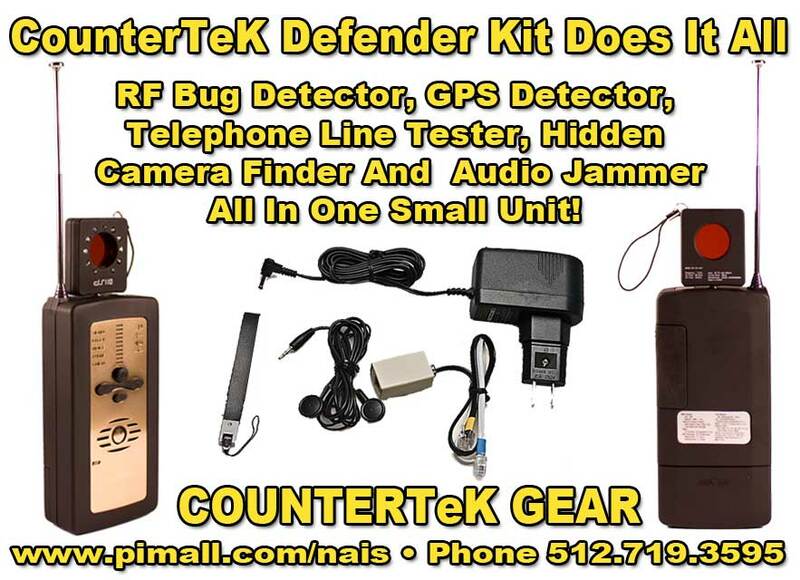 The New Generation Portable Countermeasures CounterTeK Kit saves you money and gives you important cutting-edge countermeasures sweep gear to conduct countermeasures sweeps and you save $340.00 over individual pricing! 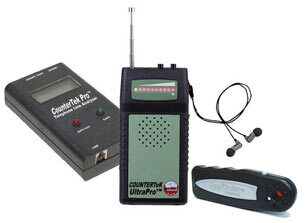 The Countermeasures starter kit consists of the the new generation TapTrap II Wiretap Detector and the new Generation Bug Sweeper that detects bugs up to 6 Ghz. 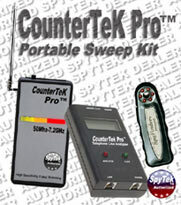 A Great starter kit for those interested in domestic countermeasures sweeps. 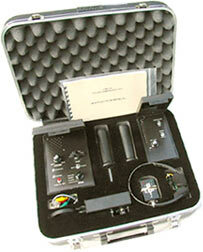 Although this is still low-end it's a fine starter kit for domestic countermeasures sweeps for the budget minded. Although you can invest tens and hundreds of thousands of dollars in expensive and fancy telephone line sweeping and detection equipment, a little known secret in TSCM circles is the use of a good multi-meter and line tracer that does about the same thing. 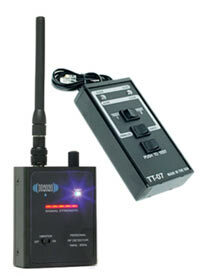 This kit includes a good multi-meter for telephone use, a good tone and probe line tracer to isolate telephone lines and the best selling 105 page manual on Wiretap Detection Techniques that shows you in step-by-step detail how to use a tone and probe line tracing kit and multi-meter to sweep a telephone line for bugs and wiretaps. This Super High Power Acoustic Contact Microphone certainly meets the qualifications for the best in it's class! The small acoustic "super sensor" pick-up is simply placed against any surface and all sound vibrations will be amplified up to 100 times via our portable 1 watt RMS amplifier and fed into specially manufactured perfectly matched active noise cancellation stereo headphones. The result is truly incredible. When protecting sensitive information is critical to your success, the OSCOR provides the most reliable and cost effective capability in the industry, including detection of sophisticated transmitters (frequency-hopping, burst/packet, and spread spectrum). 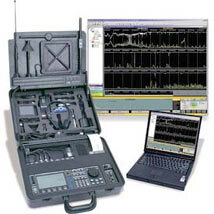 OSCOR is a complete eavesdropping detection package that is portable and programmable. Under $20,000. 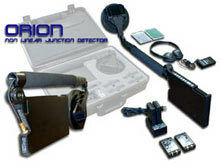 ORION (The Great Hunter) provides the capability to detect hidden electronic devices, regardless of whether the device is radiating, hard wired, or even turned on at all! 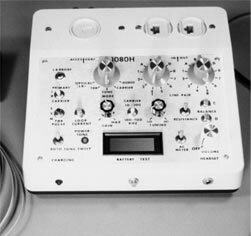 ORION is the latest advancement in Non-linear Junction Detection and evaluation for Countersurveillance. Under $20,000. Sees Where You Can Not Go! Inspect drop ceilings, behind immovable objects, around corners, or other difficult to reach areas, even in dark situations with the VPC-64 Video Pole Camera. Can See Where The Human Eye Can Not!